When you idolize someone, it becomes difficult to look past their admirable qualities and see their flaws. That’s why, when you finally face the truth—the truth that maybe your personal heroes aren’t perfect—it’s sad realizing that the person you look up to is human, and actually just wearing a Grimace costume. After discovering the truth, it’s only natural to feel betrayed. You spent years admiring your hero, believing beyond a doubt that he resided in McDonaldland being best friends with Ronald McDonald and Birdie. Finding out that the man you loved, respected, and emulated is actually hundreds of different employees in giant purple disguises is a fact that would hurt anyone. Why, though, does the pain never seem to pass? Perhaps it’s because you always held your hero above such flagrant dishonesty. Perhaps it’s because you’d never imagined him stooping to the level of society’s villains, like the Hamburglar. Regardless of the reason, the truth always cuts deep. You spent years admiring your hero, believing beyond a doubt that he resided in McDonaldland being best friends with Ronald McDonald and Birdie. It’s a revelation that leaves you with hundreds of new questions. 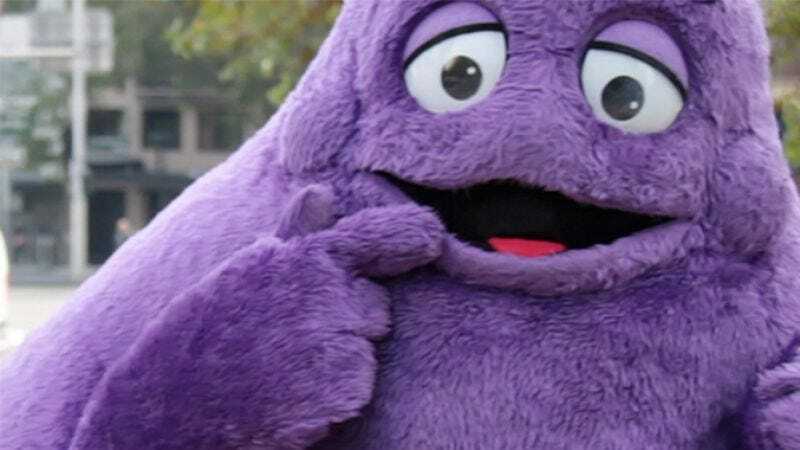 If Grimace is actually hundreds of human men and women wearing a convincing outfit, what else have we been misled about? Does he actually like cheeseburgers? Is he really purple? Do we actually know his real opinions on Mayor McCheese? In light of this discovery it’s tempting to become jaded and cynical. To turn our backs on our heroes rather than risk being hurt again. Instead, I believe we should strive to succeed where our heroes failed. We should be ethical and honest. We should be large, stupid, purple monsters that gobble cheeseburgers by the pound. Perhaps then we can realize that instead of looking up to others, we have to be our own role models and be the Grimace that he never was.